Club racers rejoice! 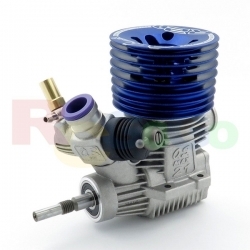 The R21 is based on the Championship heritage of the R2102 engine and delivers an unbeatable blend of power and value for 1/8 on-road racing. Its crankshaft and piston/liner are designed with premium performance and easy maintenance in mind, which makes it an ideal choice for beginners. This engine is upgradeable with high-performance O.S. Speed parts, letting you realize your full winning potential. High performance. Low price. That's what you can expect from the R21, only from O.S. The perfect power plant for rookies and club racers. Newly developed crankshaft and piston/liner with the capability to upgrade later to a Spec-class performer.